If you get the serial number off the saw (not the motor), you should be able to figure out production year (details here). Looks dusty, but in good shape. Otherwise the things to look for are deep pitting on the table and smoothness of the gears for tilt/height, any sounds while running that suggest the bearings are worn. If you were so inclined, you could bring a gauge and check arbor run-out. Is their a fence with all the pieces? Splitter and guard? Even if some of that stuff seems like a problem, it can be fixed/replaced. The issue then becomes what it’s worth minus the cost/time it takes to refurbish. Even if some of that stuff seems like a problem, it can be fixed/replaced. The issue then becomes what it s worth minus the cost/time it takes to refurbish. There is a fence. It is in the second picture. So fence is included and mitre gauge. I do not know about a splitter or guard. Im guessing the saw belonged to her husband as she does not seem to know much about it. She had it listed at 700 but is down to 500 now. Where would the serial number be on the saw? It will be on the nameplate on the cabinet. It looks like a fairly standard right tilt Unisaw. They made them from like the ‘20s through the ‘90s. Most of the parts are interchangeable. The fence is the old style with the round tubes instead of the modern Biesemeyer style. It’s serviceable, but not great. Aside from that, the saw looks good. It’s a 3HP single phase motor, which is good. The only thing to check other than the motor is the arbor bearings. 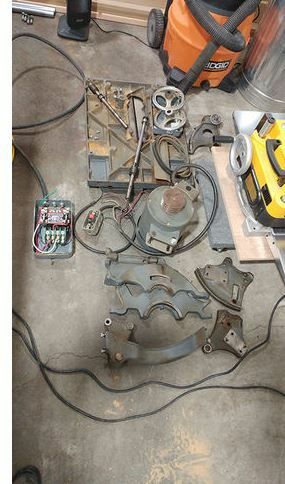 At $500 for a 3HP single phase with both cast iron extensions and what looks like a mobile base, in good shape, that’s a pretty decent deal, even with the JetLock fence. I’d take a section of 2×4, go fire it up to make sure it cuts under load, then hand over the 5 bills, then keep an eye out for a Biesenmeyer fence on CL. Ditto. I’d give the guts a decent brushing to check for cracks in the castings after I took the top off and dropped the motor for hauling. $500 isn’t too bad of a price, but figure on adding at least another $100 after purchase for new bearings, belts and a blade or two. It’s also missing the blade guard/splitter, a lock knob and the motor cover… none of which are really critical, but an added expense if you want to replace them. I’d use its neglected condition and missing bits to try and negotiate a lower price… like around $400 as an initial offer, and see where it goes from there. PS: Look around when you are there – you might find some of the missing bits and/or additional accessories laying around the shop that the wife is unaware of. The missing height lock knob is being used on the JetLock fence microadjust for whatever reason. I think it’s a good deal. While there check to see what other stuff including lumber she may want to get rid of. How bad is this fence? 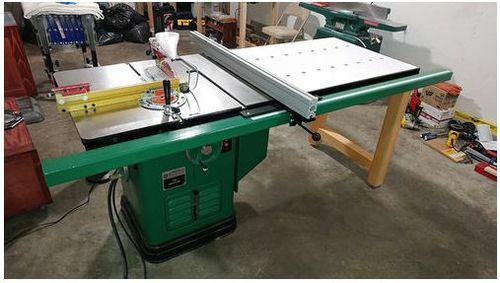 Are we still talking about a large upgrade from a bench top craftsman? Which i have not had any trouble with unless cutting thick hardwood. Is this saw with this fence still better than the Ridgid 4512 or the comparable delta from lowes? The triangle center wheels, vented front door, black DELTA only name plate, and lack of upgraded Unifence; show that it is 70’s made unit, possibly early 80’s (after Rockwell brand was dropped). Around here a 3HP 1PH Unisaw in running condition with mobile base that has a price of $500 would be last half a day or less before sold. Mobile base will cost you $70-100 for saw, so that saw is selling for <$450? My guess it is already sold, since the OP was 6 hours ago. The triangle center wheels, vented front door, black DELTA only name plate, and lack of upgraded Unifence; show that it is 70 s made unit, possibly early 80 s (after Rockwell brand was dropped). It was built somewhere between 1984 and 1988. Logo places it as being built sometime after 1984 when Delta was purchased by Pentair and started using the triangle logo (and the company was renamed to “Delta International Machinery Corporation”). And 1988 was the last year they had a dust door. When the fence is properly adjusted, they are not bad at all. They actually are a T-square type fence, although many people don’t consider them as such due to the rear hook. Regardless of fence, the Unisaw is a super-huge step up from a plastic bench top craftsman saw, and still a big step up from anything you would be able to buy at the BORG. I didn’t see the price before. I’d put four hundred dollar bills on the table and take it. Even if you have to replace all the wearing parts (bearings and belts), you’ll still make out for less than $500 and have some money to spend on a good blade. Pro tip: any auto parts store or Grainger will have the right belt for the saw. Just bring the old one in and have them match it exactly. If you put on new belts, you probably will need 3. Try to get them from the same production run, as belts with the same specs can be slightly different. Matched belts will make it run smoother. Don’t even think about the cost of a new blade. Blades are consumables. Even if you bought a brand new saw, you probably would still have to replace the blade, as the blades supplied are usually mediocre. I would definitely look for a better fence. I had the old Jetlock on a Rockwell contractor’s saw long ago, and I hated it. Did a homemade T square fence on my own. Ugly, but it worked. Of course some people claim to like the Jetlock fence, but I think they are just trying to justify sticking with that awful fence. Seems like a good deal and investment. Don’t get caught by rule #5. You’ve been looking for years? Skip the video. Tell her you’re on your way. Every time I see a post about a used Unisaw I think of this post as an example of how to rebuild and refurbish properly and completely. You won’t like the original fence. An upgrade there would be well worth it. Jonah is right offer 4 bills. I bid on and won a late 80s Delta Unisaw. The fence, I replaced with a Bessemeyer clone, Steel City fence. I don’t know if they are still around in the US. Great saw, I hope you get it. Well…..? Did you get it?